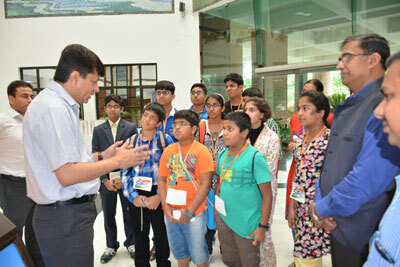 NEW DELHI: Delegation of Science India Forum - Qatar, comprising 20 students and five accompanying parents & teachers visited the BrahMos Aerospace Headquarters on July 20, 2015 as part of their tour of visiting India's premier R & D institutions. The students are winners of 2nd edition of Science Talent Search conducted by Science India Forum - Qatar (SIF), supported by VIJNANA BHARATI, India and the Embassy of India to Qatar. The students also got an opportunity to interact with Shri Sudhir K. Mishra, CEO & MD, BrahMos Aerospace. Mr. Mishra described in detail the origin of missiles, origin of BRAHMOS Supersonic Cruise Missile including all its variants, crucial role of BRAHMOS in modern war dynamics and the strides India has made in the field of Defence and Aerospace. The visit to BrahMos Headquarters helped the young students gain insight into the great scientific advancements India has made in recent times which will go a long way in imprinting an image of Indian wisdom and its scientific progress in their mind and bring out the best in them.